The Great Squidoo vs. Panda Death Match: Are We Having Fun Yet? Recent major Google algorithm updates that have helped or harmed Squidoo, according to Sistrix.com’s “Google Updates” tracking tool. Affiliate links that sell without giving users something that helps them. Google’s quality rater guidelines show that it has evaluated affiliate-link pages critically long before Panda, but I think Panda has raised the bar. keyword stuffing (Part of Penguin “webspam” algorithm). Squidoo After Google Panda 25: How’s It Looking? 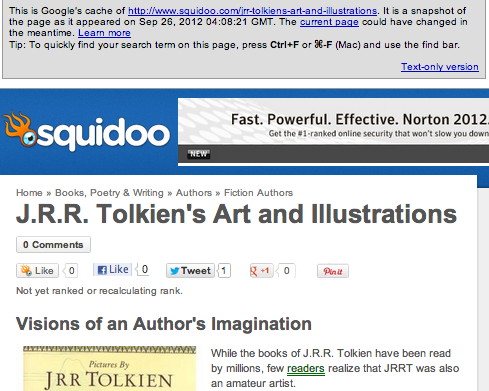 Squidoo traffic vs. a similar, comparable article site, Hubpages. Here’s my own traffic. It looks like maybe a 7% hit from Panda 25. All told, I am down 50% since before the November 16 traffic drop that sounded a reversal of my own Squidoo fortunes for the first time since 2007. Meanwhile, my own Hubpages traffic is plodding along steadily with a temporary traffic spike from a bunch of Tolkien fans discovering one of my articles. I need to do more of those. 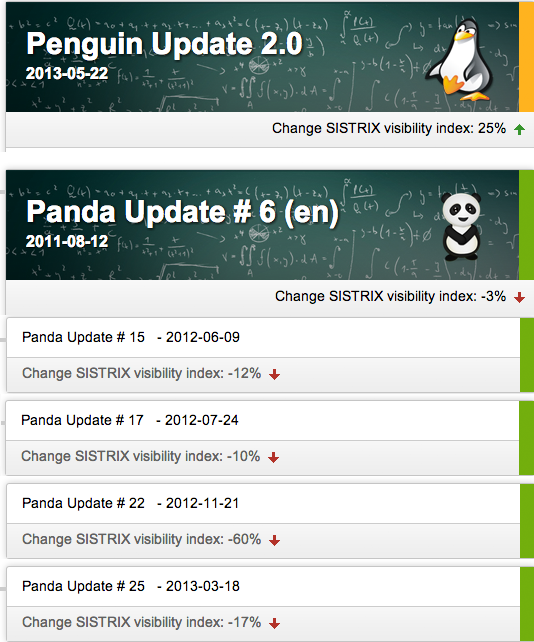 Squidoo is now ranked lower than Hubpages on Quantcast for the first time since Panda began in January 2011. Squidoo took a pretty big traffic hit in summer 2007 from Google, and I feel this is comparable. I’ve got the Google Traffic blues. 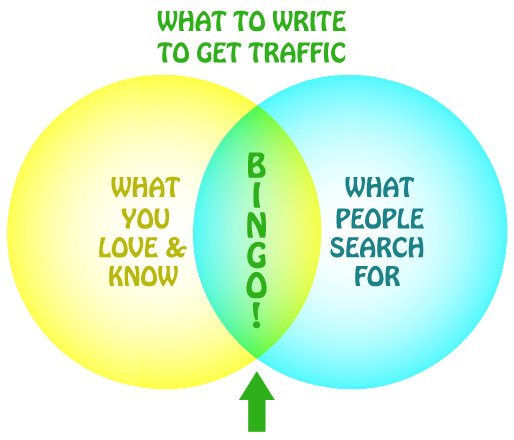 Smart online writers depend on the search queries in our traffic stats to show us what our readers are looking for, want to know, or might want to read more about. This helps us improve our existing content, by tailoring it to our readers’ needs. 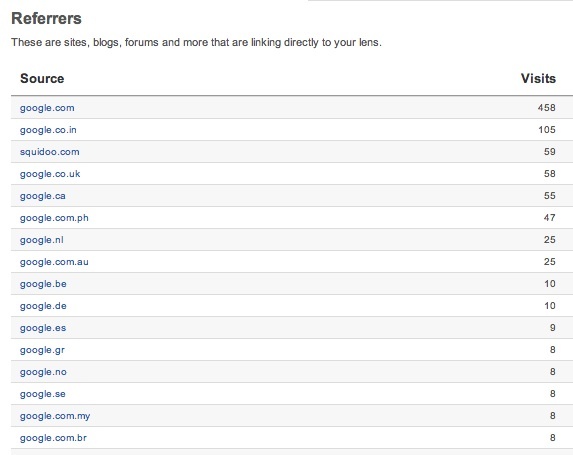 Search traffic records also help us look for leads about new topics to write on which might get traffic. Over time, observing search traffic can give you instincts about what kinds of things people tend to search for on the web, and what they don’t. This is very useful knowledge for an online writer to have. “Direct” traffic? Just what does that mean, anyway? Originally, “Direct” traffic indicated visitors navigating to our websites via a bookmark, clicking on a link in a private email, typing the URL in directly, or some other source that provided absolutely no information that our traffic software could track. To this we may now add Google search queries on iOS6. Google doesn’t usually hide search data this completely, but in some cases, it’s encrypting/concealing search data so much that when a user performs a Google search and arrives on your site, Google won’t even let your traffic software know, “Hey, that visitor came from us.” It’s as if Google were walking behind the visitor with a broom, sweeping away their footprints. 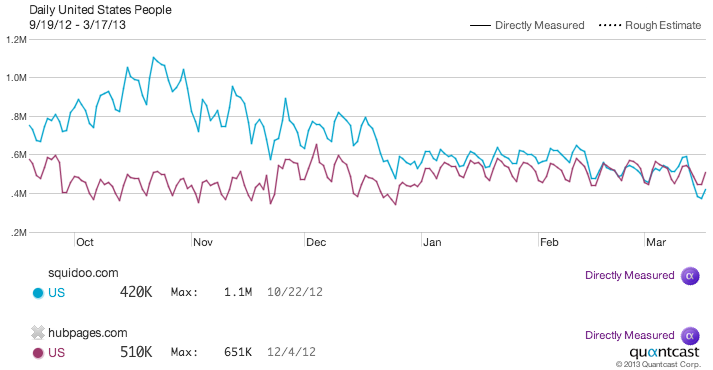 So that’s why our traffic stats now show so much so-called “Direct” traffic. It’s search traffic arriving under Google’s invisibility cloak. But all the rest of Google’s search traffic is filed under “Google,” right? And then the search queries should show up under the “Keywords” chart? Unfortunately, since Google is blocking the data from its end, there is absolutely no way to ferret out what words those visitors searched for to find your page. Not all Google search queries are hidden. In some cases, they still show up under “Keywords.” But more and more of them are not showing up. This has been going on for a while, but it’s getting worse. In 2011, Google started encrypting (hiding) search data for users logged into Google or Google Plus. At the time, Matt Cutts of Google claimed that this “not provided” data would be a very low percentage of our traffic stats data, “in the single digits.” That was an underestimate, of course. More recently, Firefox has started voluntarily encrypting searches from users using Google search at the top of its browser. More and more web applications are following suit. Since more and more third-party browsers and apps are voluntarily using Google encryption when their users do a Google search, the percentage of search terms “not provided” by Google keeps growing. Some websites are reporting as much as 50% of their search traffic is concealed by the “not provided” filter. Google claimed that blocking search data was done to protect visitor privacy, but it’s a pile of crock. Google advertisers get access to search query data which is “not provided” to the rest of us. Basically, you have to pay Google now to get complete data on what your customers are looking for. If you’re doing it as a commercial advertiser, you get to snoop on people’s web searching habits; if you’re doing it as a writer trying to learn what your readers want, tough. Luckily, we’re not entirely dependent on Google to help us learn what our visitors want. Bing, Yahoo, and other search engines are still reporting their search data to Squidoo, so we’ll still see plenty of examples of what kinds of searches are bringing visitors to our pages under the “Keywords” column. But we’re missing a complete picture. We may not be seeing the most popular searches bringing visitors to our pages, or, at the least, only a fraction of those searches are turning up in our “Keywords” column, with the rest hidden. Two months ago, Glen Stok, I, and others reported that the new Hubpages Profile redesign failed to work with Google Authorship. A few posts from HubStaff assured us that these kinks would be worked out. So let’s review this week’s Hubpages news, shall we? Hubpages’ new “Pending Status” kludge means new hubs can’t be indexed by Google for days, perhaps weeks, resulting in lost traffic. Hubpages’ new Profile pages mean that OLD hubs lose traffic, too, as soon as Google drops the author info and icon that was attracting traffic to many of our hubs. I assume Hubpages will fix both these problems. I hope. 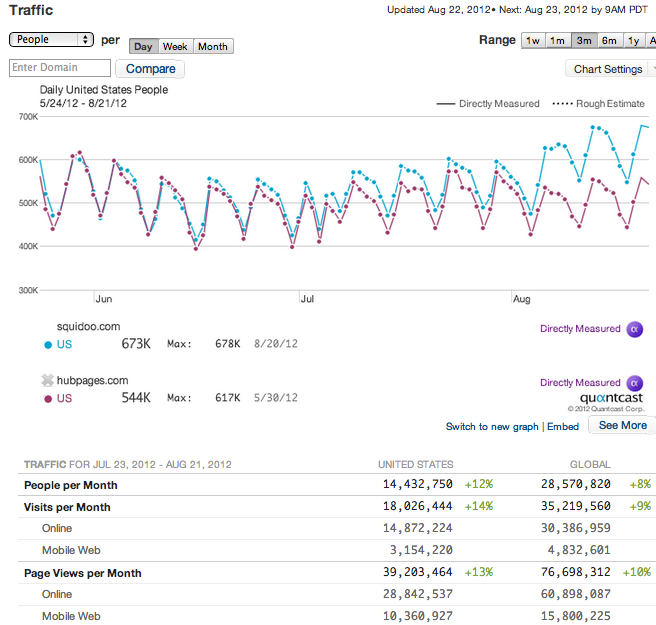 Query: How fast can new content on Hubpages and Squidoo start getting significant traffic and earning income? Which platform is best for publishing on trending, buzzworthy news and events? When Hubpages introduced Idle Status, I wrote a hub about how Idle Status worked and possible ramifications. I drew comparisons with Squidoo’s WIP status. A debate came up in that article’s comments about new hubs vs. new lenses. Squid∩ forum discussions helped me understand how the two sites deal with a newly-published article. This is important, because it determines whether a new article can get any search traffic or catch the wave of a traffic spike from a trending topic. Around midnight, Squidoo turns the lens red on the dashboard and marks it as WIP, but does NOT put a noindex tag on it. This will remain true until Hubpages removes Pending status AND search bots return to the page and recrawl it. Also, if you edit the hub after it’s been published, it will reset the Pending clock, and it could be another day before Hubpages moves it out of Pending status. I believe that once a searchbot sees a new hub with a NOINDEX tag, that search engine may not return or recrawl the article for several days, but it could be a few weeks. (Recrawls happen more often on pages that searchbots expect to be updated frequently). This makes it dangerous to share a link to a new hub anywhere, even on Twitter, where searchbots may see the link. Publicity: On first publish for both hub and lens, I tweeted the URL using the event’s official hashtags and shared a link to it in a Squid∩ forum post. I retweeted the hub on Friday after I edited the hub and added my photos. Hub traffic from GA as of Monday 8:30AM - 130 pageviews, 79 unique, from sources: 49 Squid∩, 40 hubpages, 21 Twitter, 10 from Twitter widgets on online newspapers set to display latest Tweets from #spottheshuttle hashtag, 10 direct (probably me reloading). 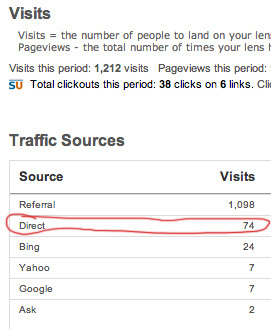 Lens traffic from GA as of Monday 8:30AM – 163 pageviews, 114 unique, from sources: 104 Google search, 29 Squid∩, 6 direct (I emailed it to relatives), 15 Twitter (including Scoop.it), 8 other search engines. The hub finally came out of Pending Mode on Sunday, over 48 hours after first publish. A new hub won’t get search traffic. However, a new hub gets internal traffic (visits from other hubbers), due to the fact that Hubpages has a “followers/activity stream” inviting other hubbers to come by. If you promote a new lens immediately after first publish, it will be indexed by Google and has the potential for instant search traffic. By using official hashtags related to the event, I not only received direct Twitter traffic during the height of the buzz, but also, traffic from automated Twitter widgets displayed on various websites — newspapers, Scoop.it — displaying the latest Tweets for a topic they were covering. PRIOR to Hubpages implementing Idle status, the answer was “Yes, but only on Hubpages, not Squidoo.” I had hit upon this as a great Hubpages strategy, sucking in thousands of visitors during the height of an event (e.g. the Mars rover landing) which petered off to 5-20 visits a day longterm. Hubpages pays for ad impressions and ad clicks, so a traffic spike like that could result in a crunchy payout. Whereas on Squidoo, the answer was “not unless you can drive affiliate sales,” because a new lens isn’t eligible for advertising revenue until the first of the month AFTER it’s published. Basically, now neither site is an effective platform for publishing fresh, new, buzzworthy content on a trending event. Either you get zero search traffic for the first week or so (Hubpages) or zero advertising revenue (Squidoo). My hunch is that Hubpages will respond to member concerns about Pending Status = NOINDEX and fix this problem. However, as long as “Pending” status means no search traffic for days or weeks after first publish, I am disinclined to publish new hubs. Which is good news for Christene, my Zujava referrer: it’s time for me to start learning what kind of content works best on Zujava. I published J.R.R. Tolkien’s Artwork at 8:10 PM Tuesday night. 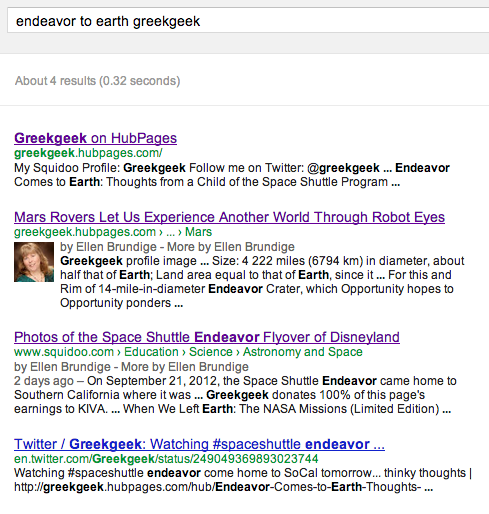 To get Googlebot’s attention, I Tweeted, cross-linked with related lenses, and link dropped on Squid∩ and Dreamwidth. Googlebot crawled at 9:08 PM (Screencap). As of 9:47 PST, lens was still blue, still NO noindex tag. BUT a search of the sourcecode at 10:40 revealed no sign of noindex (screencap). I checked again at midnight; ditto. Compare with sourcecode (screencap) of this old, fallen-into-WIP lens whose sourcecode includes noindex/nofollow meta-tags. First search traffic from Bing at 1AM. (Which shows why we shouldn’t only consider Google). Duplicate Content Penalty vs. Spun Content Penalty: Look at This! Here’s yet another search result puzzle which tickles my curiosity. Background: A lensmaster posted a complaint about Zujava and Wizzley cracking down on spun/duplicate content. We know that penalizing sites with lots of duplicate content is an integral part of the Panda algorithm. But wait…that’s a penalty applied to an entire domain. Does the spun content creator care what they’re doing to the host site’s Panda reputation, if spewing out a lot of low-quality junk in a hurry gets SOME traffic and SOME income? True, Google is sending warnings about duplicate content to some webmasters, but it sounds more like warnings for exact copies of pages, not spun/reworded/paraphrased copies. Riddle me ree, riddle me roo, why is Hubpages traffic different than Squidoo? And what the heck happened around August 4/5? At first, my hunch was that this was due to one of the other algo tweaks. But I don’t think it’s that. 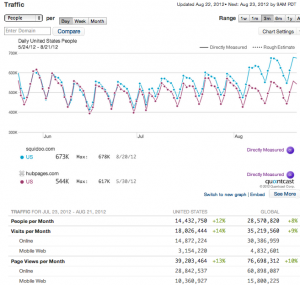 With past algorithm tweaks, we’ve often seen Hubpages dip afterwards. But this isn’t a dip. Squidoo is climbing. What’s up? 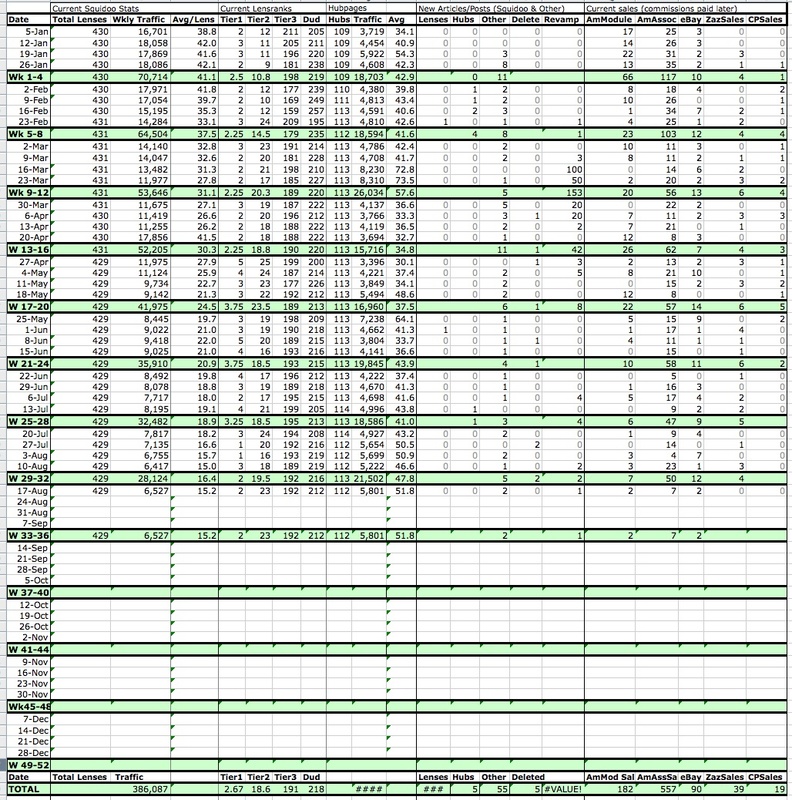 Hubpages has a lot more writerly writers, whereas Squidoo has a HUGE chunk of Rocketmoms, work-at-home moms…. see a pattern? They create a ton of lenses based around kid-related and family-related products. I suspect we’re seeing a back-to-school climb, corresponding to the dip in traffic starting at the end of May . What’s odd is that Hubpages writers also have mentioned a summer slump, but they’re not seeing a climb yet. I suspect there are more “informational” hubs and fewer sales hubs, or at least fewer sales hubs catering to the Soccer Mom demographic. Squidoo seems to have a lock on those. But that’s just a guess.